Pope Leo XIII and St Gemma Galgani -The first ever recorded video and audio of a Pope. Interestingly, the years of Pope Leo’s Pontificate (1878-1903) coincided exactly with the life of Saint Gemma. He was the only Pope she ever knew, and she prayed often for his intentions. Pope Leo XIII's Papacy began on Feb 20, 1878--just 19 days before her birth on March 12, 1878, and it ended with his holy death on July 20, 1903, only 3 months and 9 days after Gemma's holy death on Holy Saturday, April 11, 1903. Thanks be to God we are blessed to be able to witness the oldest known footage of a Pope in existence. The film below of Pope Leo XIII was created in 1896. The audio portion is also the oldest known audio recording of Pope, recorded in 1903 only a few months before his death. The audio (which begins about halfway through the video clip) is of Pope Leo XIII chanting the Ave Maria in Latin. This precious video and audio is stored in the Vatican archives in Rome. What a treasure it is to receive the blessing of the Pope who reigned during the life of St Gemma, over 100 years ago! 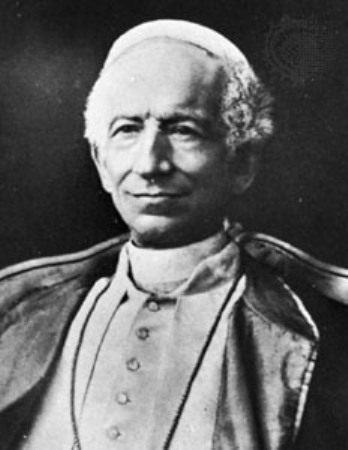 The extraordinary vision of Pope Leo XIII on September 25, 1888. Among other things Pope Leo XIII is known for is the well known prayer to St Michael the Archangel often recited by Catholics throughout the world. Pope Leo wrote the prayer to St Michael after an extraordinary vision--On September 25, 1888, following his morning Mass, Pope Leo XIII became traumatized to the point of silence. Those in attendance knew something extraordinary was happening to him. "I do not remember the exact year. One morning the great Pope Leo XIII had celebrated a Mass and, as usual, was attending a Mass of thanksgiving. Suddenly, we saw him raise his head and stare at something above the celebrant's head. He was staring motionlessly, without batting an eye. His expression was one of horror and awe; the colour and look on his face changing rapidly. Something unusual and grave was happening in him. "Finally, as though coming to his senses, he lightly but firmly tapped his hand and rose to his feet. He headed for his private office. His retinue followed anxiously and solicitously, whispering: 'Holy Father, are you not feeling well? Do you need anything?' He answered: 'Nothing, nothing.' About half an hour later, he called for the Secretary of the Congregation of Rites and, handing him a sheet of paper, requested that it be printed and sent to all the ordinaries around the world. What was that paper? It was the prayer that we recite with the people at the end of every Mass. It is the plea to Mary and the passionate request to the Prince of the heavenly host, (Saint Michael the Archangel, defend us in battle...) beseeching God to send Satan back to hell." The prayer itself is actually significantly longer, but the above is the commononly used summary.